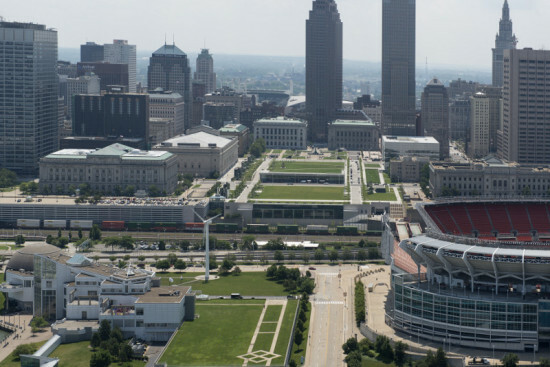 The Republican National Committee (RNC) selected Cleveland this week for the site of their upcoming convention. Cleveland beat out Dallas with a bipartisan lobbying effort that lasted months. At their 2016 convention Republicans will nominate a candidate for President, hoping to regain the White House after eight years of Democratic leadership. But what does it mean for Cleveland? According to the city’s mayor, Democrat Frank Jackson, about $200 million. That’s how much economic activity the convention is estimated to create, mainly for utilities, hotels, airport businesses and restaurants. Cleveland’s Quicken Loans Arena is expected to host floor events for the convention in June 2016. It’s not free money, though. As Diana Lind pointed out for Next City, the RNC asked its host committee to front $68 million for its venues and security—standard operating procedure for the federally subsidized political meeting. Lind noted that a study commissioned by last election season’s host committee, Tampa Bay, found more than half of the direct and indirect spending the RNC brought to the city was in the form of telecommunications upgrades by AT&T, Verizon, Sprint, and TECO Energy—infrastructure improvements that might have happened anyway. Cleveland has bet big on convention centers in recent years, building a Global Center for Health Innovation that aims to be the “Epcot of healthcare” at the heart of downtown’s Daniel Burnham–planned civic core. In an ongoing effort to start an urban recovery that will stick, Cleveland could use the RNC convention to show off the city’s growing trade show business in a city whose unemployment rate remains above the national average.